Lowdown: A Jewish boy and an old Arab general store owner become like son and father. 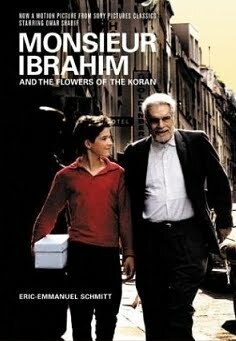 There is a lot going for Monsieur Ibrahim and the Flowers of the Koran (2003), or by its French name Monsieur Ibrahim et les fleurs du Coran. It’s a film set in Paris. It’s a film discussing the relationship between a Jewish boy and an old Arab. It’s a film starring Omar Sharif. And as the film starts, the promises seem to be delivered. We follow young Mois, or Momo (Pierre Boulanger) as he’s commonly called. We are introduced to Momo as a young child when he’s given a piggy bank and told how to save money; then we fast forward to the 16 year old Momo that breaks his pig and uses the money to lose his virginity through a sympathetic prostitute just across the street from where he lives. A prostitute who, like the rest of her guild and like the Arab shop owner Monsieur Ibrahim (Sharif) know our Momo for many years now. After all, at this Parisian quarter during the fifties everybody knows everybody else. Once thus introduced, we learn more about Momo’s family. His mother left him together with his better-at-everything brother. His father is a hard working man leaving Momo in charge of running the household. With these harsher circumstances coupled with natural curiosity, Momo gets gradually closer and closer to Ibrahim. So close that they, in effect, become like father and son. Now comes the hard part. The problem with Monsieur Ibrahim and the Flowers Of The Koran comes as a result of where the film takes this relationship to. I get the Jewish-Arab metaphor and I get the two kin spirits getting closer, but I did not get where it is that Monsieur Ibrahim and the Flowers Of The Koran takes the relationship to. Perhaps that is the charm of the film; in my view, and without providing much in the way of spoilers, it is too detached. As in, what is their [convertible] car trip to Turkey trying to imply? Thus what starts promising ends up disappointing. At an hour and a half long, and with the first half passing quite quickly, the rest of Monsieur Ibrahim and the Flowers Of The Koran can even feel tedious and boring. Best scene: Given the obvious tensions involved with losing one’s virginity I thought that scene was done really well. Probably much better than the way American films would have made it to be. Overall: Interesting at first but bordering the hazy at its second half. 2.5 out of 5 stars.